The typical peanut butter and jelly sandwich is made up of a couple of slices of white bread, a big blob of peanut butter and two or three spoonfuls of jelly. It’s maybe not the healthiest thing in the world to eat, but it’s really not all that bad. Peanut butter is a good source of monounsaturated fats and minerals. The main problems are the overall high-calorie count and the lack of fiber from plain old refined white bread. But, with a couple of swaps, you can enjoy a nutritious PB&J that won't wreck your diet. Give these tips a try for a PB&J you'll enjoy and feel less guilty about eating. Every sandwich starts with some kind of bread, including the PB&J. Standard store-bought white bread is made with refined flour, which means the wheat is stripped of its bran and germ before it's made into flour. Bread made with refined flour lasts longer than whole-wheat bread and has that soft light texture so many people love. If you think about it, about all white bread does is hold the sandwich together and it really doesn’t have a lot of flavor of its own. If you swap out your old white bread for 100-percent whole-grain bread you'll add a nice nutty flavor to your sandwich. Most grocery stores carry several varieties of whole-grain bread so you can opt for regular whole-wheat bread, delicious spelt bread, or choose a loaf made with a flavorful mixture of whole grains, including barley and oats. If you're gluten-free, you can find some fine tasting high-fiber loaves made with interesting ingredients. Some pickier eaters just don’t like whole-grain bread of any kind, but that doesn't need to be an issue because you can buy white bread that is still whole-grain bread. Whole-grain white bread is made from a type of wheat that is lighter in color and has a milder flavor, and it’s just as healthy as brown whole wheat flour. Once you've picked out your bread, it's time to examine the peanut butter. All in all, peanut butter is a good wholesome product as long as you choose a brand that doesn’t have added sugar. After all, peanut butter is already delicious, so it doesn’t need any sugar. Smooth or chunky peanut butter has the same nutrition content, so pick whichever type you prefer. Another option is to use is a nut butter made from nuts other than peanuts, such as almond butter. There’s not much difference between the two nutritionally speaking, but almond butter has a pleasant flavor that goes well with whole grains. You can also find cashew or soy butter in most grocery stores. Peanut and nut butter are nutritious, but also high in calories, so if you’re watching your weight, it’s important to keep an eye on your serving size. And if you've been told to avoid sodium, go for a brand that doesn't add any salt. Even better, at many stores, you can grind your own peanut butter or nut butter from bulk nuts. Check the bulk food aisle for this option. It will have no added salt, sweeteners, or preservatives. A typical store brand jar of jelly is made from fruit juice, sugar, and pectin. Nutritionally speaking, you’re mostly just getting calories from the added sugars, and there’s no fiber. It probably doesn't taste all that great either unless it's a high-end brand made. What’s a better idea? Use reduced-sugar jam instead of jelly. Choose a healthy fruit spread made with just the fruit and no added sugar. The fruit spread is still deliciously sweet and not adding sugar helps cut the calories a bit and you even get some fiber. Actually, with a high-quality fruit spread, you taste the fruit rather than goopy sugar. 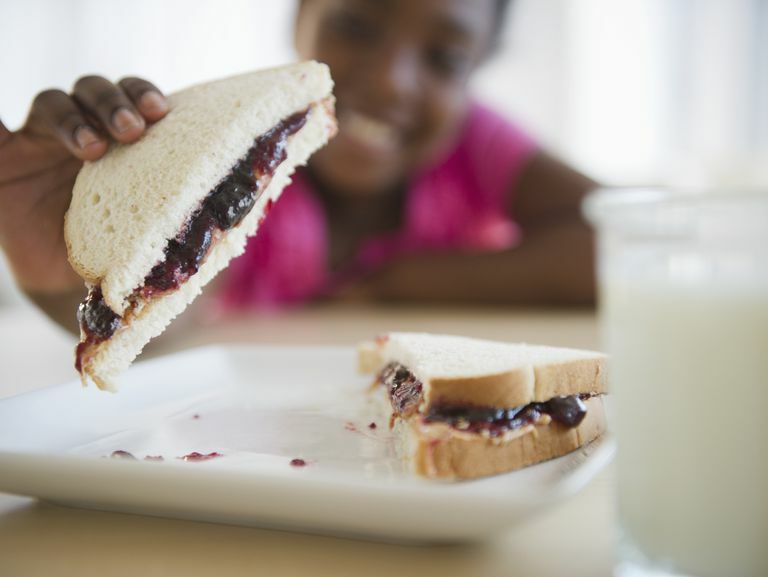 You could skip the jelly altogether and add fresh or dried fruit to your sandwich. Of course, it wouldn’t technically be a PB&J anymore, but a sliced banana is delicious with peanut butter, or you can top your sandwich with raisins or even thin apple slices. Almond, Cashew or Peanut Butter: Which Is Better for You? How Can Ezekiel 4:9 Bread Fit Into Your Diet?